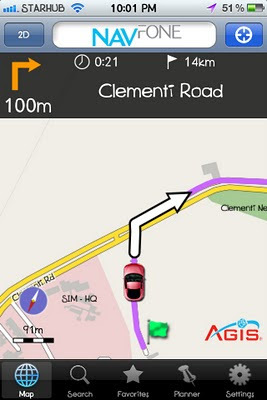 Against the better known products by TomTom , Sygic and Papago, comes a fairly well-made GPS voice navigation app for the iPhone. 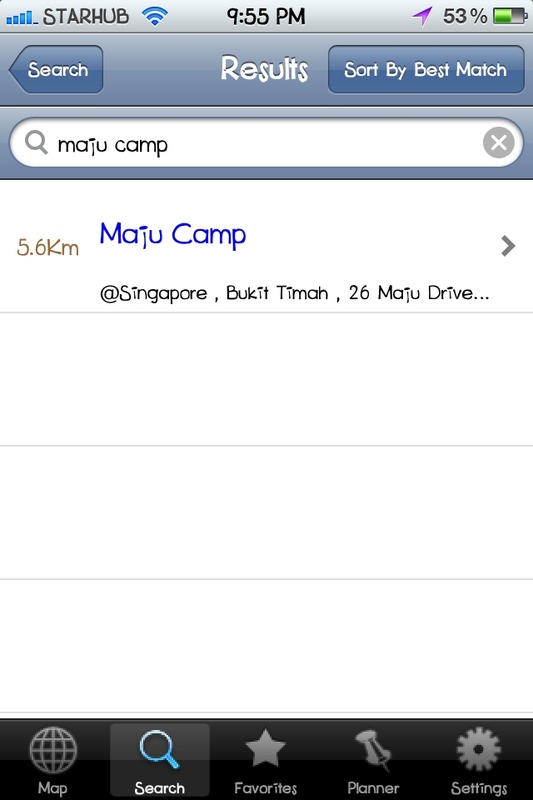 Like its bethren, Navfone is able to operate offline since its map and POI database is included in the app. Initially, I was quite sceptical of Navfone since its user-interface is very utilitarian in its design and does not have any fanciful graphics. However, since it is a local product, one would expect it to perform better with its search engine in terms of speed and accuracy. In this area, it does not disappoint. 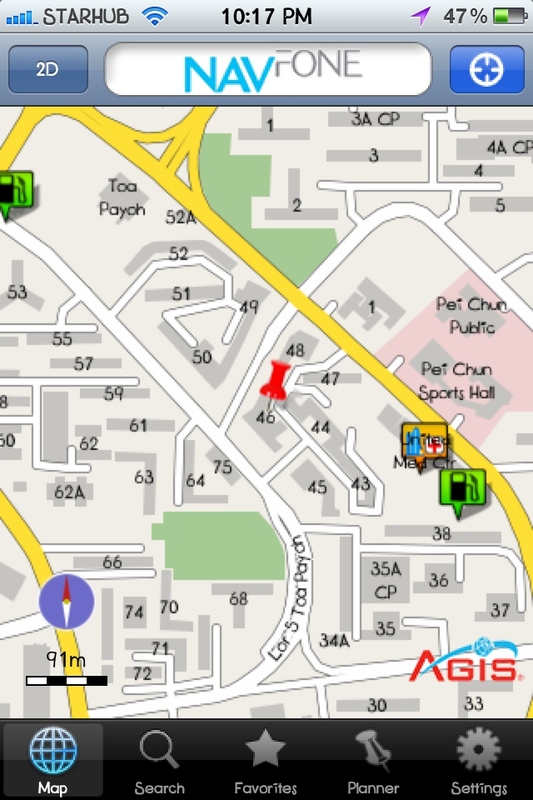 Navfone was able to show the correct places and map positions almost immediately after I performed searches of the following: Bird Park, 46 Lor 5 Toa Payoh, Marina Bay Financial Centre, Maju Camp, Iluma. Searching "46 Toa Payoh Lorong 5"
In terms of features, Navfone was also quite basic but I feel that it has stayed focused on the more practical toggles such as Avoid ERP/Toll, Reroute, and Audio cue intervals of 200m, 500m and 1km. 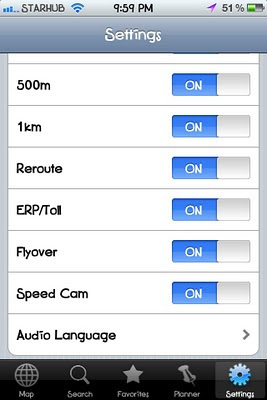 Having used the Garmin 255W previously, I can appreciate this fuss-free approach. Again, showing off its local pedigree, Navfone is able to toggle between various audio languages such as English, Chinese, Bahasa Malay or Bahasa Indonesia. Under Planner, besides the usual choice of routing from a start point to a destination, there is also the ability to run a simulation of the route. 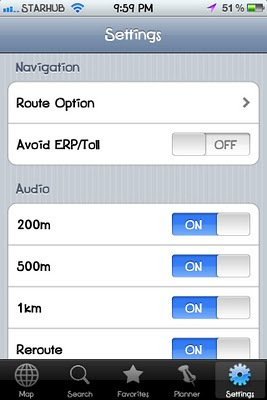 This is useful if you need to review your route in your office or home (without GPS coverage indoors) before setting off on your journey. Headquartered in Singapore, AGIS was founded in 2000 and now has over 50 experts in GIS across the region, with subsidiaries in Indonesia, Sri Lanka and Vietnam. Besides the Navfone Singapore app, it has also released apps for other areas such as Malaysia, Bali, Luzon, Cebu, Java, Vietnam and, Trindad and Tobago. 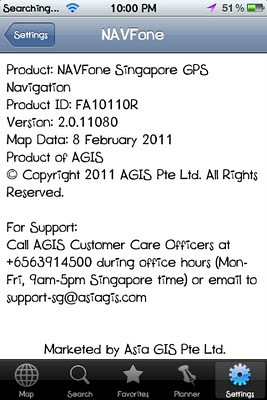 There is also an App that covers both Singapore and Malaysia at $14.99, whereas the Singapore app alone will cost $9.99. The Navfone app is fairly usable for those who value an accurate and fast search engine, and it has a basic interface that is intuitive and easily usable (due to the lack of fanciful features). The maps are less colourful and detailed than its competitors but that may not be an issue for those who merely want an accurate and responsive voice navigation aid. 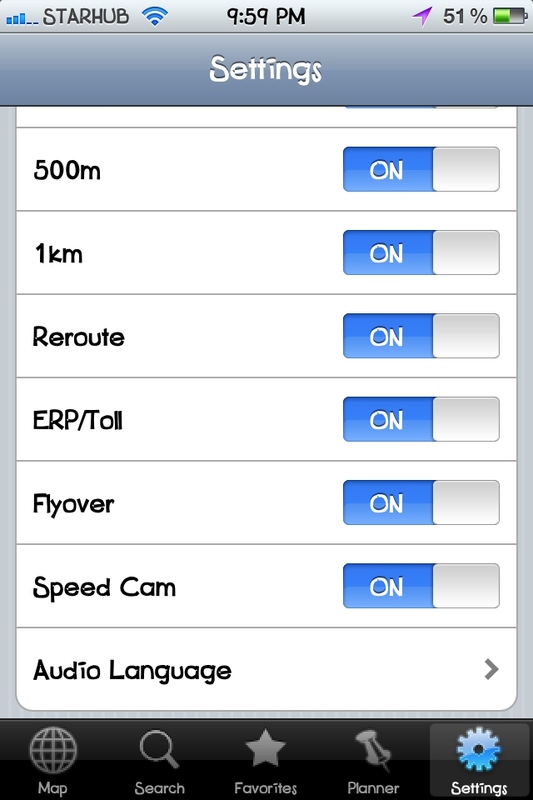 In addition, the appsize is at a lean 54.2Mb compared to 100-400 Mb for the other better renowned navigation apps. 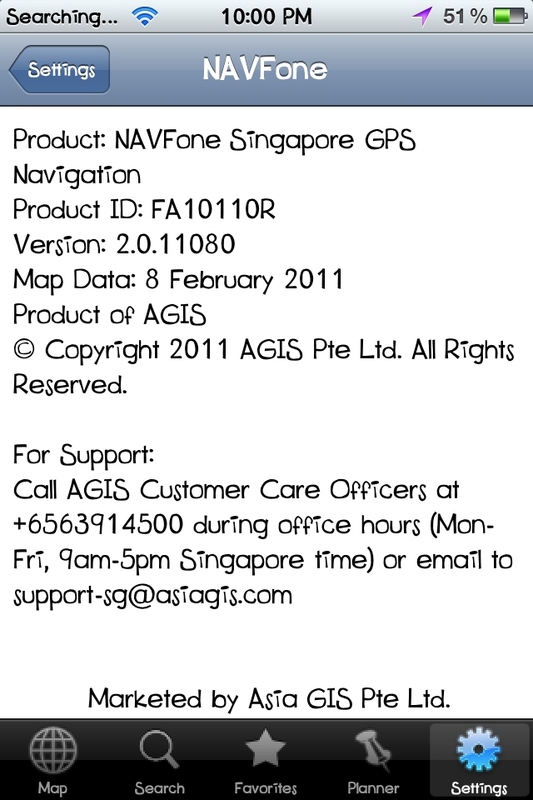 Note: Version 2.0.11080 was used for this review which has Mapdata dated 8 Feb 2011. 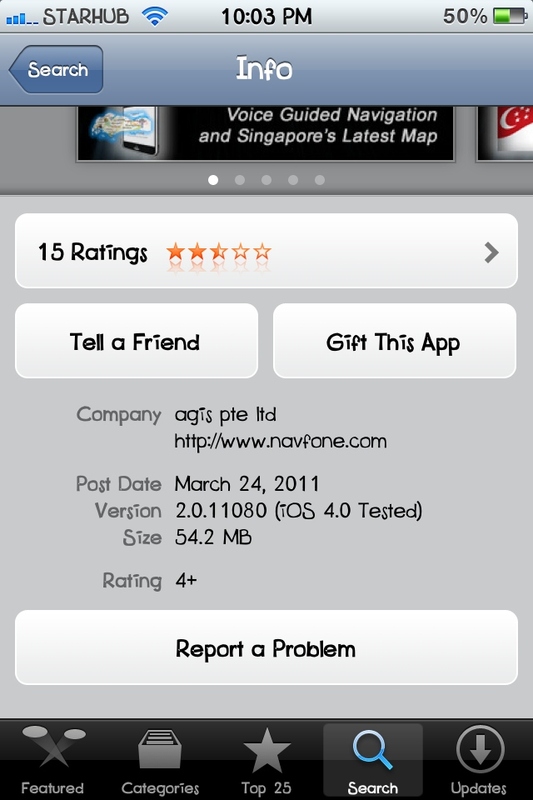 The current appstore version is Mar 24, 2011.